The visitors often struggled to cope with the bounce the Sophia Gardens surface offered to the English bowlers. 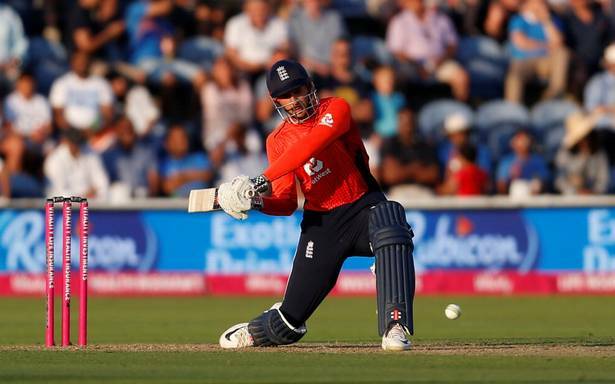 England Alex Hales stayed till the end to take his team to victory in the second T20 international against India in Cardiff on Friday. Alex Hales scored a brilliant 58 not out off 41 balls with four boundaries and three sixes. England were off to a brisk start by their openers but Indian bowlers bounced back to scuttle the England middle order. But Hales and Bairstow stitched a 34-run fifth wicket partnership to bring England closer to victory. Hales wasted no time in the over of Bhuvneshwar Kumar hitting him for 12 runs in 4 balls to take England past the Indian total. Earlier, the seasoned Mahendra Singh Dhoni clobbered 22 runs in the final over and lifted India from a precarious 22 for three to 148 for five in testing conditions in the second T20 International against England in Cardiff on Friday. Skipper Virat Kohli top-scored with 47 against a much-improved England bowling, but it was Dhoni’s effort that gave India’s total a semblance respectability. Dhoni remained unbeaten on 32 off 24 balls with the help of five boundaries. Sent into bat after the coin landed in favour of Eoin Morgan, India were off to an inauspicious start, losing the opening duo of Rohit Sharma and Shikhar Dhawan and last game’s centurion KL Rahul, with just 22 runs on the board. However, Kohli stood firm amid the ruins and found an able ally in Suresh Raina (27), with whom the captain added 57 runs for the fourth wicket. Coming into the game on the back of a convincing eight-wicket victory in the opening game of the three-match series, visiting India were in for a few shocks early on as Jake Ball, playing in place of Moeen Ali, seemed to justify the selection by having Sharma caught behind in the second over. Dhawan was run out because of poor running between the wickets, while the in-form Rahul was bowled by Plunkett to leave India reeling in the fifth over. Having made 27 off 20 balls with the help of two boundaries and a six, Raina was stumped by Buttler off Adil Rashid, the spinner making amends after being hit for a six and four by Kohli in his previous over. Three short of his half century, Kohli fell to a good catch by Joe Root off the bowling of David Willey, as England celebrated the huge wicket. Kohli struck two sixes and a four in his 38-ball knock, before former captain Dhoni took over. For England, Willey, Ball, Liam Plunkett and Rashid picked up a wicket each.